Axtra PHY is the latest generation phytase and has advantages over E.coli and Fungal derived phytases. 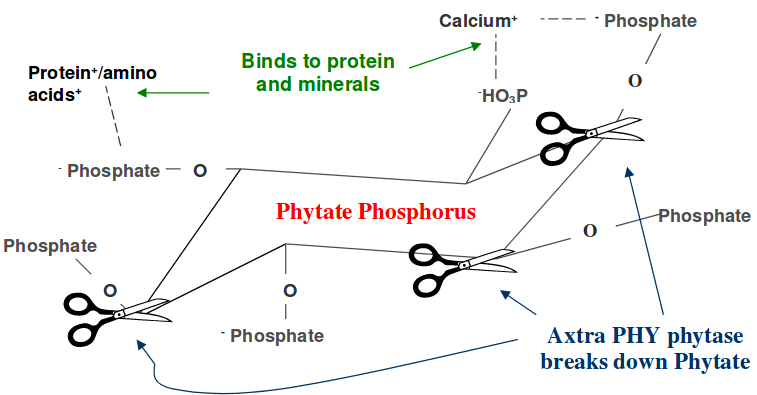 Axtra PHY phytase breakdowns down phytic acid to release phytate-phosphorus (P). Phytate is an indigestible source of phosphorus found in grains and vegetable proteins and is also an anti-nutritional factor in monogastric diets. Phytate also binds to protein, amino acids, starches and other minerals making them unavailable to the pig and bird. Axtra PHY supplementation significantly increases nutrient availability and can potentially save between $5.00 and $20.00/tonne in average diet cost. The dose rate of Axtra PHY ranges between 500 FTU/kg to 2000 FTU/kg depending on the diet and phytate content. Axtra PHY is available in a heat stable (up to 95C) powder or in liquid forms. The application of Axtra PHY should be discussed with a qualified nutritionist.